Locked thread | Replies: 20423 (Who? ), Viewed: 1157732 times. One of the biggest downsides in The Sims titles has always been their load times. Currently I could fire up my Sims 3 neighborhood and safely go AFK for about 7-15 minutes before I get in-game. During the demo (which was stressed to be played on the alpha version of the same live client that players will have) it was amazing to see the initial load of the game take about 30-60 seconds. Another load into a gym lot took maybe 15 seconds, which was a short load time but much different to experience after playing in The Sims 3's open world so much recently. From someone who was at E3. 60 seconds to boot up the game and around 15 to load the lots.. that seems pretty reasonable to me. I think we should be thinking of these estimated load times as a maximum instead of an exact time. If I remember, one of the gurus was saying that they're working on minimizing loading times. So I'd say this is good, if 60 for the entire game and 15 for a lot is the max. I think so too, Khaleesi. Original_Sim giving some sort of praise to TS4? Am I reading too much into things? Was my drink drugged? Is the world ending? I see loading screens and neighborhood districts as an improvement because of how poorly executed the open world was in the Sims 3. Unlike others, I don't enjoy scrolling over to a section of the "world" only to have to sit through an entire second of GRAY-WHITE CHUNKS OF NOTHING while waiting for the lots to load. Speaking from experience with previous Sims games, loading screens don't last very long on a decent computer whereas the GRAY-WHITE CHUNKS OF NOTHING in the Sims 3 are always present even on powerful systems. Check out the official EA live broadcasts. The developers encounter the same issue, but they choose not to say anything about it. So yes, I am all for loading screens if it means not having to experience the horror of lots loading before my very eyes. "We have two different options in game. If you want to enable automatic aging for your own Sims for played households. Or if you want to enable it for all of the NPCs in the world." He then goes off to clarify that played households are households you have played. So if I play in rotation, does that mean all my houses age automatically? That's not rotational play, I want the houses I do play to be static, not the opposite. Of course he does say this: "So I can jump between my household and another household and they can both be aging — if I want them too — or I can turn that back off." But what does that mean? Does that mean you can also set your current active house to ageing only? Because that's kind of a third option Graham. Or does the "enable it for all NPCs in the world" means everyone but your played households age? Still not what I want, but better. Argh, I don't get it. Let me help explain aging options a bit more clearly. First, you can globally set the lifespans of Sims to be short, normal, or long. This applies to all Sims, no matter if you've played them or not. Second, you can choose if unplayed Sims (any Sim that you've never taken control over) automatically ages or not. Third, for Sim families you have played as (for rotational gameplay), you can enable or disable automatic aging and it will apply that setting to all of those families simultaneously. You do also have a third choice for played households to set it so that only the family you're currently playing automatically ages, and all your other played households will pause their aging until you're currently playing them again. Further, in Live Mode, you can use a birthday cake to age up not only your own Sims, but you can use it to age up other unplayed Sims without having to play them, at the time of your choosing. Someday I would love to expand the aging options so that they can be set per household, but we're already shipping robust options in the base game that give you a variety of approaches to how you play. Look out, you'll have Graham on your back, he wants us to call them neighborhoods. I've seen him correct people a few times and he did it on the SimsVIP interview too. Lots in Neighborhoods, Neighborhoods in Worlds. That's the terminology. People already get confused when reading explanations, that will only be more difficult if everyone uses different terms. You'll hear our studio refer to Worlds, Neighborhoods, Public Spaces, and Lots consistently when speaking about The Sims 4. Drawing updated to include your homemade delicious pizza. This is adorable; thank you I'm going to hang it up in the studio! Understandable. Guess we all seem to be in the same boat with this. I think the issue is Sims 3 was way too ambitious with it's time. It tried to implement things that, at the time, were huge game changers. But because it was 2009, it fell flat on its face. Now they just want to play it safe, it seems. I thought I read it right. Thank you. I do have a question? What type of life progression will go on in households not played? Will they marry, have children, have parties, etc? Just wondered if there will be any type of progression or will they die out? Wait, Graham! Before disappearing again, please just confirm. Between lots, are there loading screens or a pause in gameplay or something? I just wanna know what to expect, as someone who gets kind of ADD with lots. Briefly: I didn't know you posted here. Thank you for stopping by! I figured we were kind of the vocal AND invisible minority here. I'm glad to see that's not the case and I also want to tell you your SimsVIP video was THE moment I stopped being so bitter and cynical and started to be more hopeful. I'm sure we're a pretty demanding and capricious fanbase, but we do love the franchise and we WANT to love TS4. Thank you for bringing us tangible info. #16191 15th Jun 2014 at 5:33 AM Last edited by 9b8ll : 15th Jun 2014 at 6:02 AM. [email protected] Thank you this video is helpful. I have a HDD with decent gigs of ram and a very good video card. I might need to invest in a SDD drive. I know this is a little late, just have say that the SimsVIP interview with Graham was great!! She did it way better than any game journalists! Didn't waste no time. The part that really intrigued from the interview me was how Graham said whole neighborhood works,rotational gameplay,the gallery and finally something about custom content! So it's seems like the whole game is going to be somewhat a semi-open world this time just like in the Sims 2 but a bit of a mix of the Sims 3. Which I don't mind. Now since the Sims 4 has loading screens I also won't mind only if the game has 10-60 second load time by switching between neighborhoods. If it's longer than that, then I do mind. Once the game comes out I want to see this in action. For the custom content and the gallery, I really wish that Graham went into more detail about CC in general. Is he or the devs still going going to allow to a CAW and Bodyshop in the Sims 4 game. Speaking of that if custom worlds and once the game comes out that it might be are do able will it require the newest Simcity game a tool equivalent like CAW or neither? This is still confusing to me about this whole ordeal since the game began. And it's still keeping me from getting this game I'm sorry that I have to say that again. I just want to customize, color and play the game simultaneously. Edit: If graham reads this post I hope he can say anything about any adding offical tools CAW, CAS custom swatches in the game or more (If you can) about how CC works in the gallery and does mean that custom anything like clothing and objects (except mods) can be in the gallery too? Edit 2: Thanks for clarifying about aging and neighborhoods. know I'm a little glad about aging and neighborhoods and I am pretty cool about that! Okay this is something that is still on my mind. Some members here that are happy that CAST is gone because it lagged the game a lot. I need some simmers here and answer and questions about this. If some of you are happy that CAST is gone, do you think a color wheel or by adding your own color swatches will be a great replacement to customize anything? 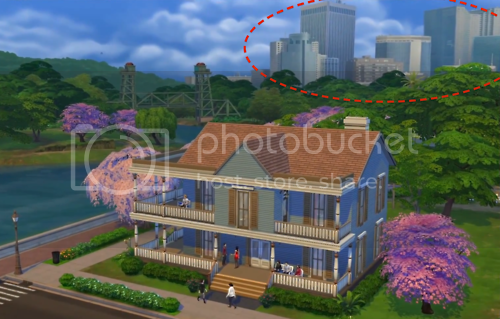 Do you also think that these two alternatives will also make the game laggy or are you okay the way the color swatches the way it is in the Sims 4, if so why? Just a curious question. I think we'll just have to relearn terminology. When I hear neighborhood I think of Pleasantview, but it probably won't be too hard to kick the habit. If you find the time, could you clarify on how lot to lot loading will work in-game? For me and a lot of people, that SimsVIP interview really helped calm a lot of nerves about the game. You and Alexis should high-five for achieving that feat sometime. Thanks for stopping by, Graham! And on a Saturday! E3 was probably hell on your immune system and your sleep schedule, so taking the time out to answer some questions here is really appreciated. I am so ready for a safe, stable game. Thank you very much for the info about the global aging options, Graham. So I guess this is where the simmies disapear to when they're going to work and such? First: QueenJimmyIV i love your drawings. Second... ohhh hellow dear graham. third:... when counting for loading screens i never imagined one for "visiting" neighbors next door.. i assumed that was already loaded.. but makes sense... sad! I hope the loading will be bearable when the expansions start rolling out. Oh, and all the downloadable content: The Sims 4 Pools R US, etc. If so, 10 bucks says an expansion opens up that area. Either a late night or workforce expansion. I just want to go to a city, dammit. I just wish we could see the neighborhoods...5 lots sounds very small and claustrophobic...I seriously doubt it feels that way playing, but I only have my imagination at this point. It would be nice to see this system in action to reassure players that the world still feels active and open! The world, Willow Creek, is made up of five neighborhoods. In each neighborhood there’s the potential for up to five lots (some neighborhoods have less than five lots) and open public spaces that have objects on them for Sims to use. Those five lots include both residential and community lots for a total of 25 potential lots per world.